Scott with his partner Becky. Scott Stinson, 25, was diagnosed with Osteosarcoma during the second year of his PhD studies in chemistry and nanotechnology in April of last year. He had his right arm and shoulder amputated in Birmingham Royal Orthopaedic Hospital in August after chemotherapy failed to halt the bone cancer. Now he is campaigning to raise £120,000 for treatment that is not available on the NHS but is but licensed in other countries. Scott said the cancer had spread to his lungs and his oncologist has told him the only treatment available would be to extend his life, rather than save it. “I have exhausted all possible curative treatments available to me on the NHS,” he said. Scott’s mother Jill, who set up the GoFundMe page, said his strength and determination had been immeasurable. 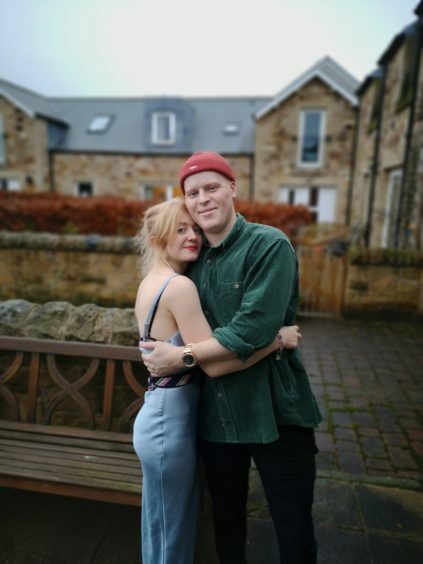 She said the family were also grateful to Scott’s girlfriend Becky, who has paused her Masters in costume design in Edinburgh, to help care for him. Scott and his partner Becky. “We need to consider urgently other realistic treatment options in the likely event that treatment in the UK will not be prescribed,” she said. “W are currently researching treatment options abroad whilst still pursing the possibility of receiving immunotherapy in the UK. He was selected for a place at the UK Research Council funded Centre for Doctoral Training in Critical Resource Catalysis at St Andrews University, under the supervision of Dr Euan Kay. 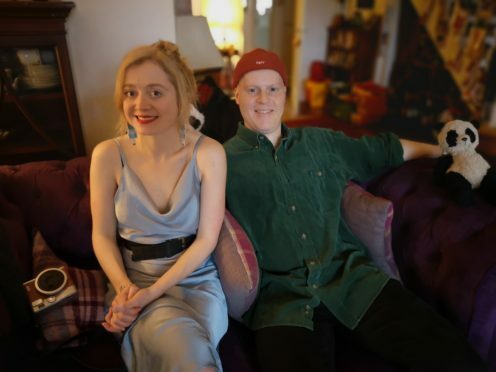 ‘See Ya Sarcoma’ is an online store which has been set up by a group of Scott’s friends to accompany the GoFundMe page. They are calling for artists, creatives and photographers who are willing to donate their items to come forward to help Scott reach his target amount. Anyone wishing to donate can do so via https://www.gofundme.com/scott039s-sarcoma-solution.